Growing up a treat was always to have pickles or sauerkraut and I was told it was good for you. Little did I know that the sauerkraut and pickles I was eating were delicious but they were not a healing food. To tell you the truth, I probably wouldn’t have cared at that point in my life. Fast forward many years and I’ve since discovered that the eating lacto fermented foods can heal not only your digestive tract but they can build your immune system, and reverse many diseases. So why isn’t everyone eating them? How can you ensure that you are receiving all the health benefits of the food you consume? You can make it yourself or purchase at a local farmers market or store that you ensure is making their pickles without the use of vinegar, sugar, heat and chemical preservatives. 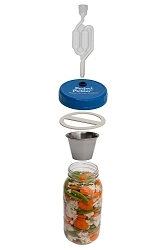 Many years ago I found a very cool device called the Perfect Pickler to make my sauerkraut making “goof-proof” I since added them to my website as when I taught a fermenting class my students wanted them. 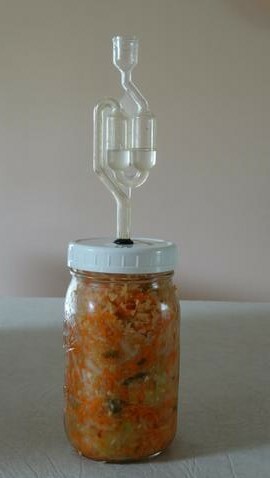 Last week I made my first version of Kimchi and everyone why has tried it, loves it. Here’s the recipe. I hope you enjoy it as much as I am loving mine. Sprinkle the salt over it, mix it up and leave it in the bowl with a plate over it and a gallon jar of water on top of the plate - what happens is the salt will pull the water out of the cabbage and you will come back after an hour or so to a puddle of water at the bottom of the jar then you will want to massage the cabbage mix so it is very watery (if you don’t want to wait, just begin massaging the cabbage/salt mixture and it will take maybe 15 minutes of this to get your desired result. Mix and then stuff into your mason jar – it should be very liquidy and you should not need to add any water to it. 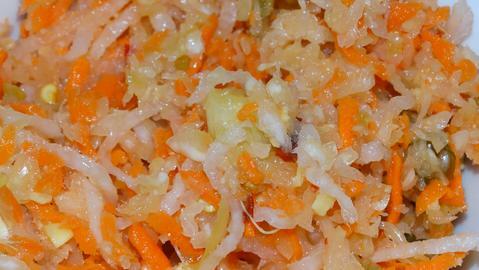 If you are using the perfect pickler, stop about 2 inches before the top of the jar, the pieces of cabbage you cut in step one, slice them in half and then put them in the jar at the top of the mixture as if you can imagine the top of a box would look when you are repacking it, zig zag the pieces so that all you see is the cabbage top and liquid above it. Place the overflow cup in, there should be enough water around the cup, then the lid and the airlock. If you aren’t using the perfect pickler you want to use something to weight down the cabbage under the fluid but be careful you don’t get any mold growing. Then put in your refrigerator and enjoy. Just a few tablespoons a day will be amazing for healing your gut. Dr Andrew Weil makes a batch of Kimchi weekly using the perfect pickler. Try it. By eating these amazing fermented foods you can work on healing your gut which then creates health is every other part of your body. Enjoy !